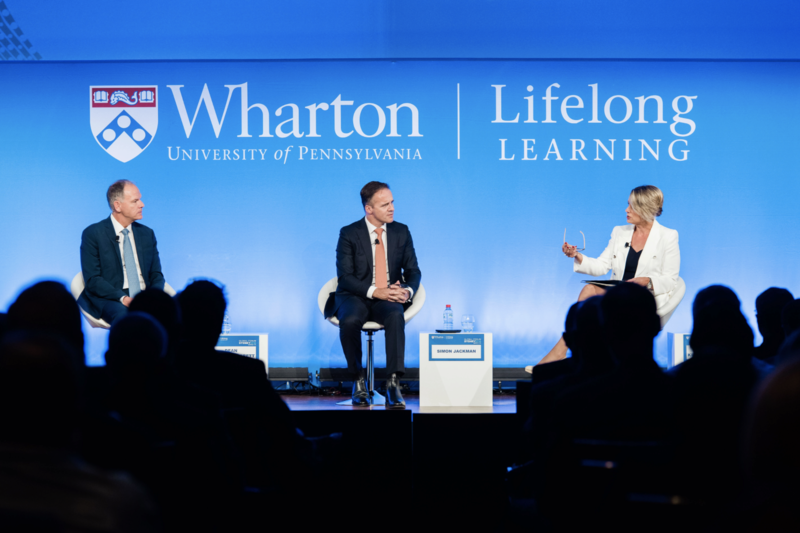 Though the keynotes and fireside chats were long-planned, speakers seized the moment and took on the timeliest issues and headlines in business, geopolitics, and economics. Here is a snapshot of some of the key takeaways and perspectives from the Forum. 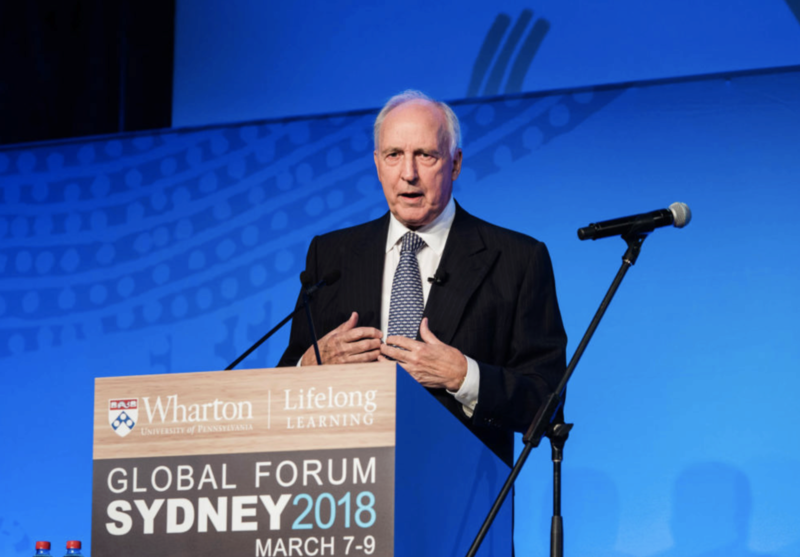 The Honorable Paul Keating, Chair of the International Advisory Council, 24th Prime Minister of Australia (1991-1996) addresses the Global Forum during the Plenary Keynote. 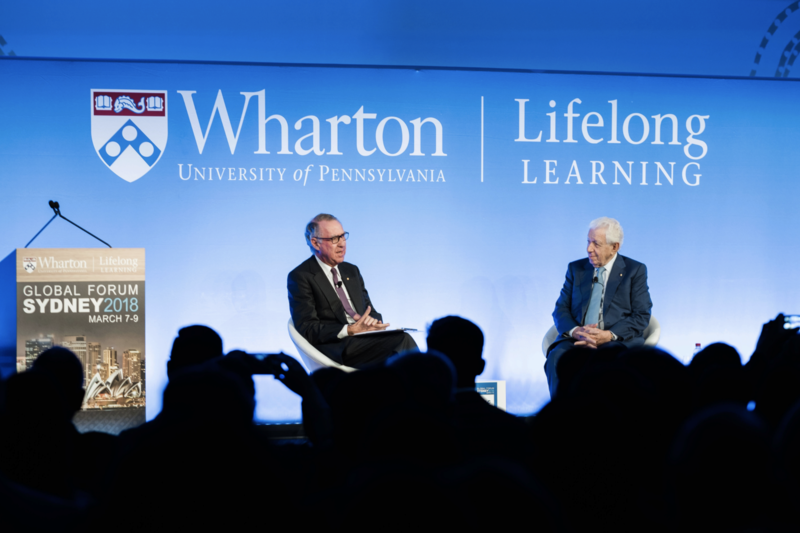 The Honorable Paul Keating’s keynote address at the Wharton Global Forum attracted headlines for his surprising affirmation on President Donald Trump’s policy on U.S. and China diplomatic relations. But the former Australian Prime Minister gave the Forum audience a master class in geopolitics, describing a visit to East Germany in 1987, his time in Tiananmen Square three days before tanks rolled in to quash protests, and his visit to Russia with the USSR State Symphony Orchestra not long before the Berlin Wall fell. Legendary global shopping center developer Sir Frank Lowy, who is retiring following the acquisition of his Australian-based Westfield Corporation by France’s Unibail in a $32.8 billion deal, believes the future for retailing remains bright. Raising the possibility of the United States introducing tariffs on imported steel and aluminum, David Gonski asked Lowy if Australia should be welcoming this change. Given the history of Australia relying on its central, grand strategy of maintaining a rock-solid relationship with the United States while benefiting from a China on the rise, Garrett said this balancing act is becoming harder to maintain. “This…is becoming more of a high wire act and it’s putting Australia in a really difficult position,” Garrett said, with Sen. Keneally saying it would be “disastrous” if Australia had to make a choice between China and America. Two developments — the appointment of “straight talker” Admiral Harry Harris as the U.S. ambassador to Australia and President Donald J. Trump’s unexpected announcement for sweeping steel and aluminum tariffs are appearing to rattle this long-standing relationship between allies. “Incremental change in the way we operate is no longer enough. Every corner of the media industry is facing a battle for relevance,” said Michelle Guthrie, managing director of the ABC since 2016. Guthrie is leading Australia’s national broadcaster in new strategic directions better equipped to meet the challenges of the digital era.